Anxiety, nervousness, fear, worry, heaviness. It doesn’t matter what name you give it, we all suffer from it and know it as stress. Some deal with it on a daily basis, and some only occasionally, but we all have our moments. The question I get from almost every client is, “Can you show me how to get rid of stress?” [Enter here the visual of them staring at me with a hopeful, please help me, I’m drowning here stare.] You are probably wondering, “Can she actually help me get rid of stress?” The answer is no. No one can. However, I can help you manage stress. That is really what we need to focus on. So many us, I myself included, try to rid our lives of stress and than have major meltdowns when we can’t achieve that unachievable goal. You can’t control the stress of deadlines, rude people, crazy schedules, traffic jams, a loss, or even an ailing parent, but you can control how you react to those stressful situations. That is the key. Your reaction is what will help you turn a hopeless stressful situation, into a hopeful one. 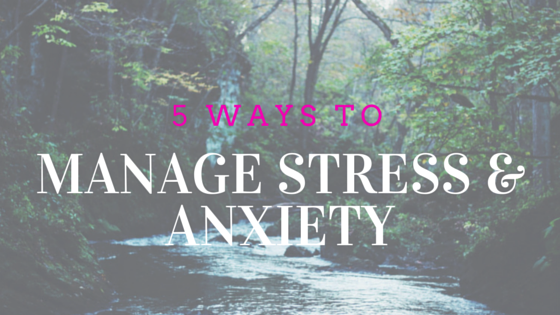 I’m going to share with you 5 steps to help you manage stress. These 5 steps are not the only steps, but they are my most used and most helpful when managing stressful times. Sweat the stress away. I know, the last thing you want to do during, or after a busy day is exercise, but honestly, it is the #1 stress reliever. When you workout, your body does a magical thing. It actually depletes stress hormones and these hormones are replaced with mood-enhancing (happy) chemicals. When we are happy, we manage stress so much better. Start adding a workout into your schedule. It is critical not only to your whole body health, but to your sanity. Spend time with people who make you happy. Who do you know that makes you feel so amazing even after a 5-minute conversation, or can make you laugh until you cry? Spending time with people who make you feel happy is such a great way to manage stress. Remember how great you felt for hours after being with that person? The positive energy stays with you and you can just feel the stress melting away, saying to yourself, “What was I so worried about?” You can even ask those uplifting people to be your workout buddy – creating double the happy endorphins! Give yourself some alone time. Sometimes all we need is a relaxing, quiet 15-minutes alone. What is the #1 thing that relaxes you? Do that for at least 15-30 minutes every single day. Even if you have to schedule it into your calendar, do yourself a favor and allow yourself these little moments. I know what you are thinking, “I don’t have time for this.” My question to you is this; do you have time to feel stressed, overwhelmed, and worn out? When you take care of yourself, you are better equipped to take care of others, and your daily tasks. If you want to know what I do to relaxing, you can check it out here.